Time to set sail (ha ha) for this week's SHOPPING OUR STASH challenge....Wooden Ships. For this challenge we would like you to use wood / veneer OR ships / sailing somewhere on your project. Am I kicking myself for getting rid of the Open Seas stamp set??? You betchya!! Everything on this card is from my stash. The newest items are the enamel dots which were a Valentine's present this year from my 11 year old. 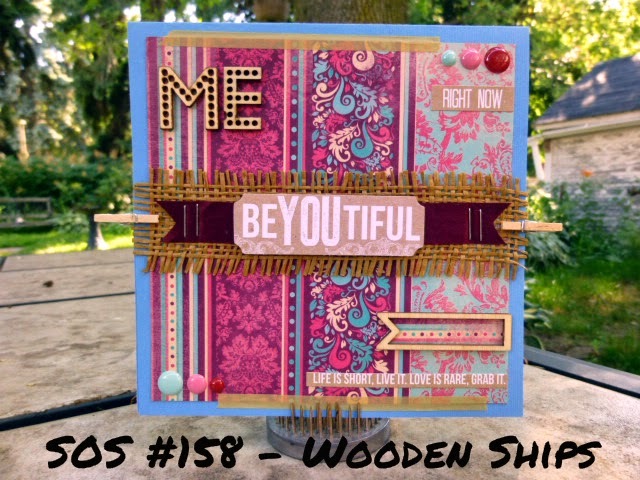 The papers are from a 2012 card kit which featured "Gypsy Sisters" by Kaiser Craft. I love the colours and patterns on the papers. Awesome use of the papers and veneer, nnot sure I would know how to use it if I had any, love the closepins. Great card. You're going to have to get Joel to teach my kids what crafty stuff to pick! lol! Your knack of mixing funky paper, burlap, wood veneer and enamel dots never ceases to amaze me! This rocks, Donna!